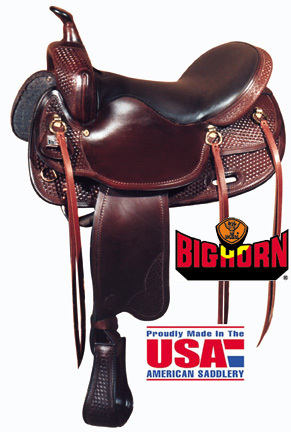 Big Horn 17" Walking Horse Saddle quarter horse bars. With 17" grain out padded seat, strings and wool skirt lining. Tree: Fiberglass covered wood treet with Walking Horse Bars. Seat: 17" grainout padded seat. Horn: 3" X 2 1/2"
Rigging: Double, stainless steel dropped D.
Trim: Solid Brass hardware with saddle strings and spot basket tooling. Wool felt skirt lining offers natural shock absorption, padding, and moisture absorption.